Configuration items can be any company, individual, location, software or device associated with your services. When you add enough to your configuration management database (CMDB) in Service Desk, you can build a web of relationships between them. This helps you understand your IT environment and how issues might impact assets. You can add new records for configuration items one at a time or in bulk. Pick the right category, customize the attributes and then set the relationships to get a clear picture of your systems and services. Once created, you can even track which incidents, problems and changes are connected to your configuration items. 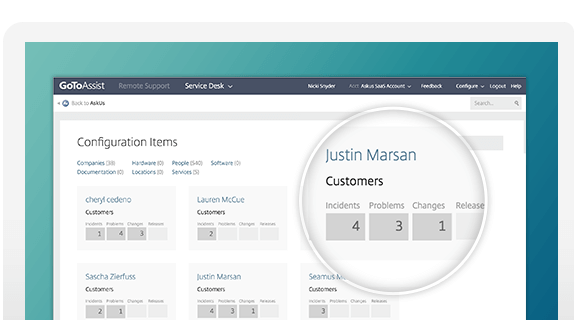 With your Service Desk CMDB, you can quickly determine the scope of an outage and which customers and users are affected. Technicians don’t need to waste time hunting the data down, so they can work fast to restore your services and reduce the impact on customers. Configuration items in Service Desk are connected by different types of common relationships, which also have different strengths. Hard relationships define items that are directly affected when the other is out of commission. Soft relationships link items that aren’t so dependent on one another. 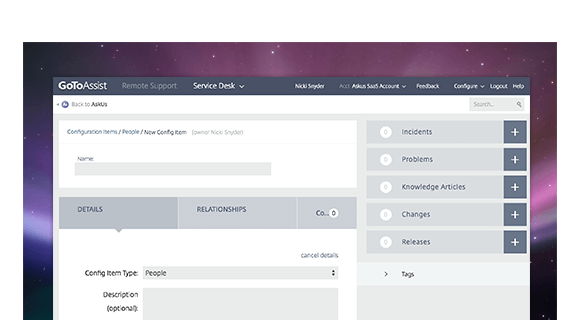 Service Desk makes these connections easy to see by providing relationship maps for each configuration item. See what's been happening to your services and who's been doing what.